If the snowstorm predicted for tomorrow doesn't cause any significant problems, there are one or two more sets expected to be stored on the TP main on Monday. 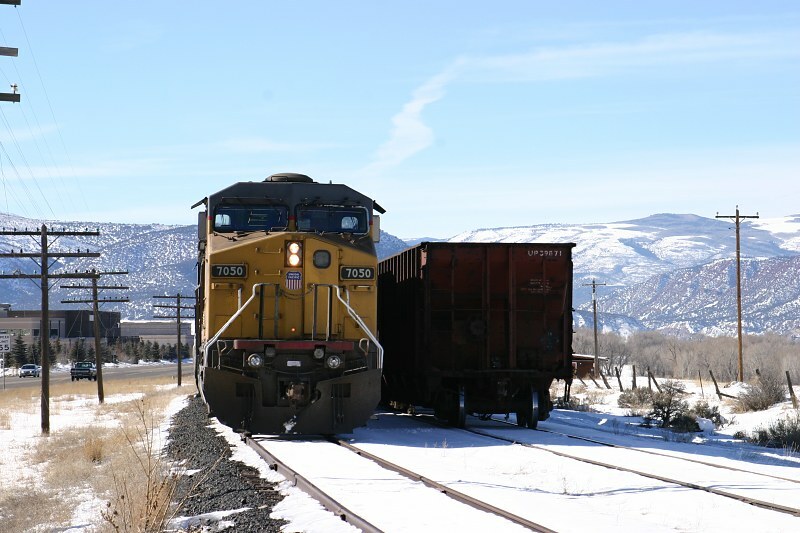 These trains, CSOTP-19 and -24, are on their way, and are expected to be stored beyond Eagle (but hopefully not beyond Wolcott) , based on information from one of the UP officals by way of Todd B. CSOTP-19 is already on the Grande, powered by UP 6344, 6578, and 6536 (trace car 45435) and having passed Arvada in the early evening. 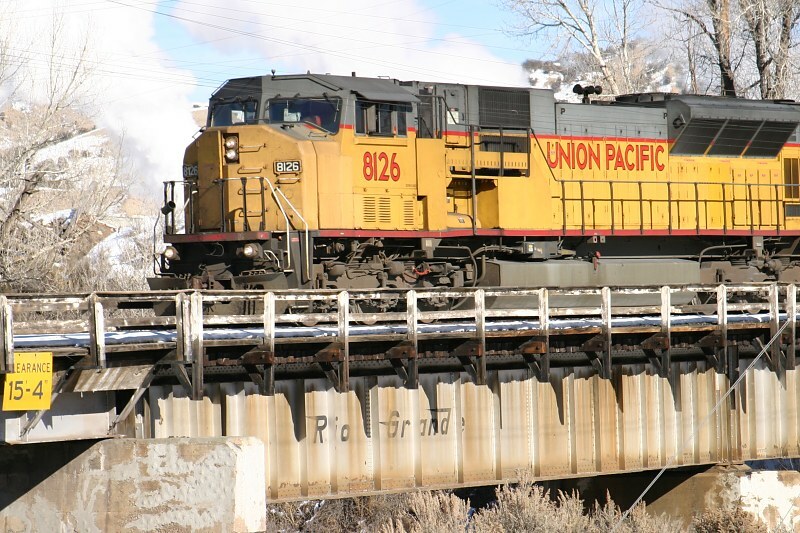 CSOTP-24 is still in Illinois, powered by UP 6833 and 6391, with a trace car of 38059. AND THE JOINT LINE CAMERA LIVES! As my life slowly starts to get back to normal after the holidays, I figured I'd wrap up what's new in DRGW land. 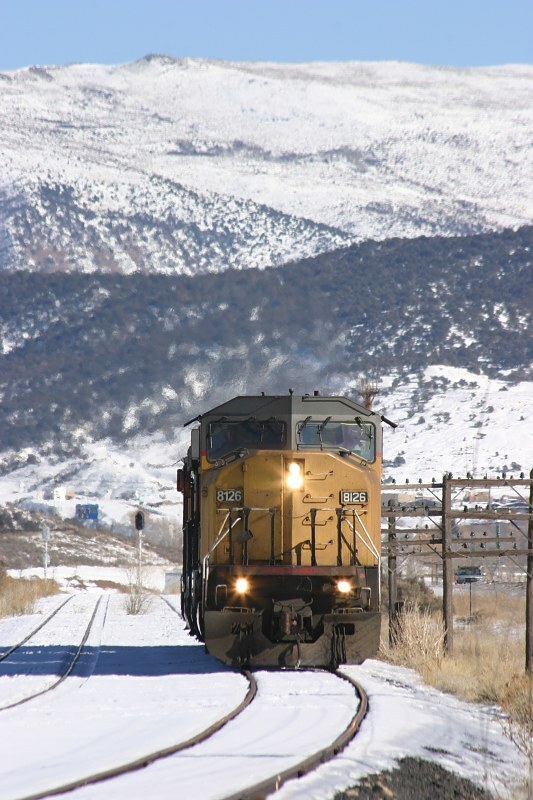 In motive power news, DRGW 5390 is up for its triennial inspection and as such has left Utah on a loaded coal train. 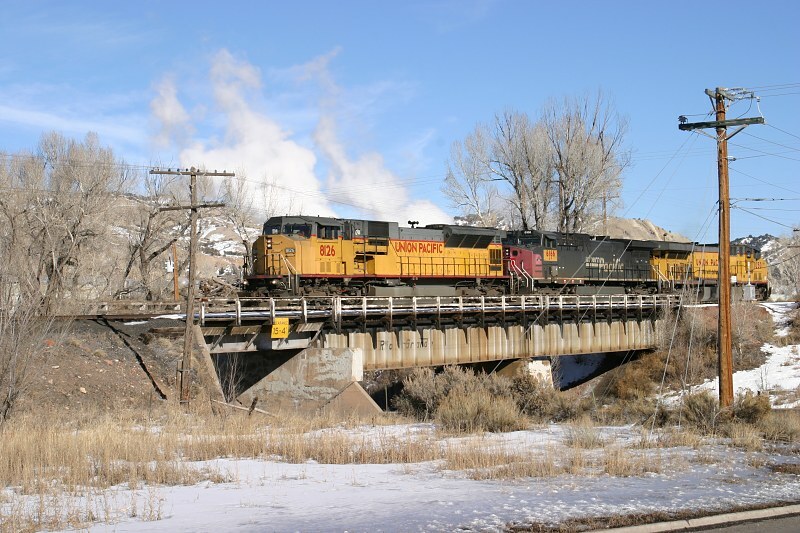 My guess is that it will eventually be routed to North Platte or Denver Diesel (Burnham) for this task. Hopefully no yellow graffiti will show up while she's in for service. 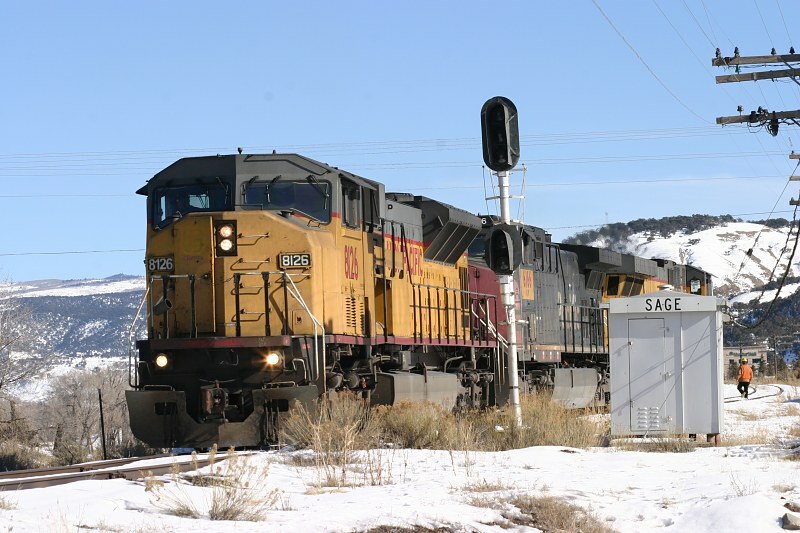 Jim Belmont also noted that 5392 has left Salt Lake - it's now reported as being in the dead line at North Platte. No word on why it was moved, but it happened in mid-November 2003. For those keeping track, DRGW 3007, 3060, and 3084 were spotted at NRE's Silvis, IL, facility over the holidays, along with SCRX 3141 (ex-DRGW 3141). Quinn Clegg has just put up a new website that will eventually have quite a few interesting historical photos from in and around the Salt Lake area. You can see it here. Tim Tonge has been scanning some of his vintage DRGW material from the 1980s, and that's coming in the next week or so. I've also received some other new paper material lately that will be going online shortly. 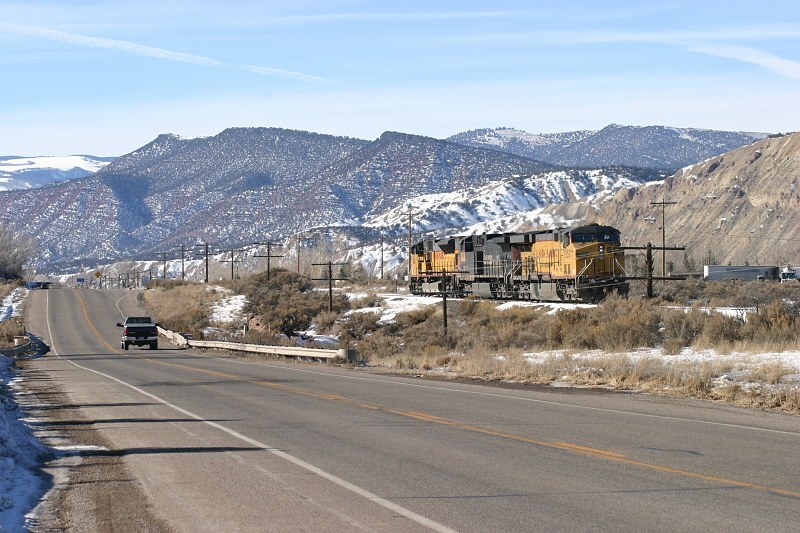 Also in the works are trip reports on the IC&E, Iowa Interstate, Montana Rail Link, and Southern Cali in October. That's all for now - enjoy the week! Well, 2004 is certainly starting off with a bang (but not necessarily a good one) in DRGW country. Amtrak 6 (the eastbound Zephyr) apparently lost both units crossing Utah today, leaving the train over ten hours late at this point. The plan (or so I've heard) is to drag power west from Grand Junction to pull it in. Here's to hoping at least one of the GE motors can still generate HEP, or that's going to be a lot of cold, angry passengers. In a completely separate incident not on Grande rails, Amtrak 5 (the westbound Zephyr) has derailed near Shed 10 in the Sierra Nevada on the former SP main. Speculation is that it's due to the large snowfall currently going on over Donner Pass. Only a few cars are off the rails, and based on what I've read so far, they're going to move the passengers to the remaining cars and take them back to Sparks.